When I first got my Xbox 360 and signed up for Xbox Live, I noticed a free offer for American customers. It was called the Xbox Live Diamond Program. It was 100 percent completely free to Xbox Live subscribers and offered lots of discounts at tons of retailers around the country. So I though why not, and signed up for it right away. A few months go by and I completely forget about it. Heck I haven’t even turned on my 360 for the past couple of weeks. But I checked my mail today and saw I got a letter from Xbox Live. I wondered what the hell it was, thinking maybe it was just an advertising thing. 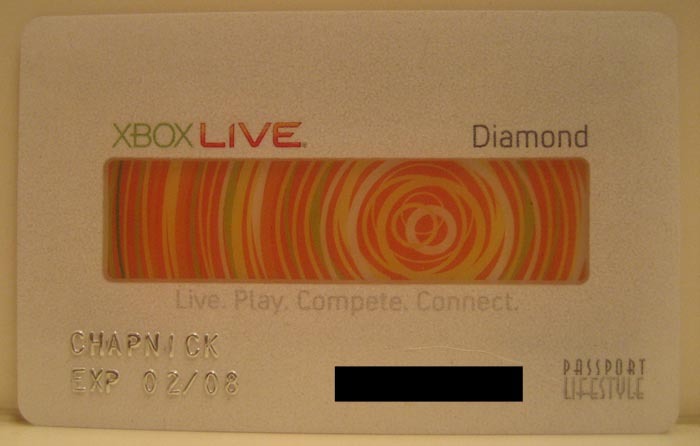 But I opened it up and was really surprised to see my own personalized Xbox Live Diamond card. The card itself is nothing fancy. It looks just like a credit card minus the magnetic strip and signature box on the back. The center of the card is semi-transparent with the nice 360 Live graphic. Below that is my Live Gamertag, expiration date, and card number. Pretty cool. The card, sometimes in combination with printed coupons, can be used at tons of retails to get nice discounts and free items. Some examples include a free Roast Beef sandwich with purchase of medium fries and drink at Arby’s, to 10 percent off all jewelry at BlueNile.com. There are a lot more retailers to choose from as well including GameStop and The Sharper Image. Some of them just require you to be an Xbox Live Diamond member, while others require you to print out and use a coupon. Most online retailers don’t need these coupons, but most physical retailers do. I don’t know how much I’ll use the card, or if I’ll ever use it at all, but I like the idea and the option to get discounts just because I’m an Xbox Live member. For more info you can check out Xbox Live Diamond’s web site here: XboxLiveDiamond.com. The web site has lots of info about the program including retailers in your area that you can visit. Plus, this site has all the coupons you’ll need to get some of your discounts.